The easy-to-use DASYLab software helps you solve complex data acquisition and control scenarios easily and quickly by working with a flowchart directly on the screen. Module icons are placed on the screen and connected with wires in a schematic diagram, which represents the flow of data through the system. Each icon represents an input, operation or output function. Real-time acquisition rates of up to 800KHz and on-line display of up to 300KHz can be achieved. The actual rates depend on the data acquisition board and other hardware used. The versatility of DASYLab lies in its rich set of function modules. These include analog input (ADC), analog output (DAC), triggers, digital I/Os, function generators, action operation*, digital filters*, spectral/FFT analysis*, and mathematical, statistical and logical operations. 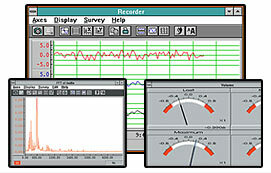 Output modules allow for file writing, DDE output, and various types of displays, including strip charts, x-y graphs, digital and analog meters, and bar graphs. User definable icons include the ability to create a Black Box icon containing many icons, enhancing the usability for large worksheets. The module icons can be connected manually or, using the integrated Autorouter feature, wire paths will be determined automatically. Results of acquisition and analysis can be displayed in strip charts, t-y graphs, and x-y graphs with a selectable system of coordinates. Linear, logarithmic, and polar coordinates are available. The results can also be displayed as bar graphs, analog and digital meters, and status lamps. The operator can interact with the displays while the system is running, changing the X, Y or time scales, selecting data channels to be displayed, or even looking back in time on the chart recorder. With DASYLab Plus, those changes to the displays can be done automatically based on system events. You can test your DASYLab flowcharts by using simulated signals from the signal generator by temporarily replacing the ADC icon with the signal generator. This, in combination with the mathematical functions, can be used to generate complex wave forms. In addition, a sequence generator is available that allows you to generate even more arbitrary functions, combining ramps and curves. PID control, and binary logic control can be defined using the module icons. Pulse generators can be used for exact time dependent control, even with complex control signals. There are a class of modules that allow you to cause events in the system based on user action acquired or calculated data. These events can automatically cause certain action. Using the action modules, you can print a display window, change the characteristics of a display window, or even change the whole display. You can automatically notify the operator of problems and suggest remedies. Data can be saved to disk in several formats via the file I/O icon. Importing of data from disk during a real-time run is also supported from files of several formats. Store and retrieve data from standard ODBC databases. Using the DDE (Dynamic Data Exchange) interface, DASYLab can act as a server, transferring data on-line to other DDE compatible Windows programs. The Worksheet Test Manager allows you to control the sequence of tests, the order in which they are performed, and provides a high level view of the series of tests. Add a variety of high-end functions,including the Transfer Function, Octave analysis, Rainflow Statistical Analysis,and Setpoint/Sequence Generation. Other programs such as Visual BASIC can control the DASYLab application by starting, pausing, and stopping the experiment. Read data from a wide variety of instruments including scales, balances and data recorders.